The successful launch of China's first space laboratory module this week sets the stage for the future of the country's ambitious space program. But now that the spacecraft is in orbit, a major docking test looms ahead for China. The unmanned Tiangong 1 prototype module launched Thursday (Sept. 29) from the Jiuquan Satellite Launch Center in northwest China. Shortly after liftoff, officials at the Beijing Aerospace Flight Control Center, the Mission Control for China's human spaceflight program, confirmed that the cylindrical module had effectively unfurled its solar arrays. Tiangong 1, which means "Heavenly Palace 1" in Chinese, will now settle into an orbit 217 miles (350 kilometers) above Earth, and mission controllers will perform a series of systems tests. 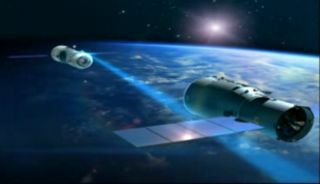 "The implementation of space rendezvous and docking mission, as well as the breakthrough and mastering of rendezvous and docking technology are the basis and premise for the construction of manned space station," China's Manned Space Engineering office spokeswoman Wu Ping told reporters before Tiangong 1 launched, according to a translation provided by the office. "It is of great significance for the realization of the three-step strategy of [the] China Manned Space Engineering Project, and the promotion of sustainable development of manned space flight." China's three-step space exploration plan, according to past statements by Chinese space officials, is aimed at first perfecting its human spaceflight transporation system (the Shenzhou spacecraft), then building a space station and moving on to a manned moon landing. This still from a China space agency video shows a cutaway of a Shenzhou spacecraft docked at the country's Tiangong 1 space lab, showing how astronauts will move between the two Chinese spacecraft. With its first space destination sailing above Earth, China is now planning a series of orbital docking demonstration flights over the next two years. According to state media reports, the unmanned Shenzhou 8 spacecraft could be launched in early November, and the mission is expected to last at least 12 days. At least two docking demonstrations will be performed. If the Shenzhou 8 mission is successful, Shenzhou 9 and Shenzhou 10 are expected to follow in 2012. The Shenzhou 10 flight may also carry the first astronauts to the Tiangong 1 module, a crew that could also include China's first female astronaut, according to state media reports. China is only the third nation, after the United States and Russia, to independently launch humans into orbit. China's first manned mission, Shenzhou 5, was piloted by Yang Liwei on Oct. 15, 2003. Two more manned missions followed, in 2005 and 2008.